What materials are used in making an Erica Harel bag? Erica Harel products are crafted from carefully selected lightweight premium soft Italian leathers. Slight variations in color and texture, as well as small imperfections in the grain, are typical of genuine leathers. These traits, as well as the leather’s vulnerability to scuffing or slight stretching at traction points, are normal, and not considered defects. With daily wear, your bag may become slightly softer and a bit darker – giving it even more character. For bag linings, and fabric-based bags we use water-resistant Italian fabrics. 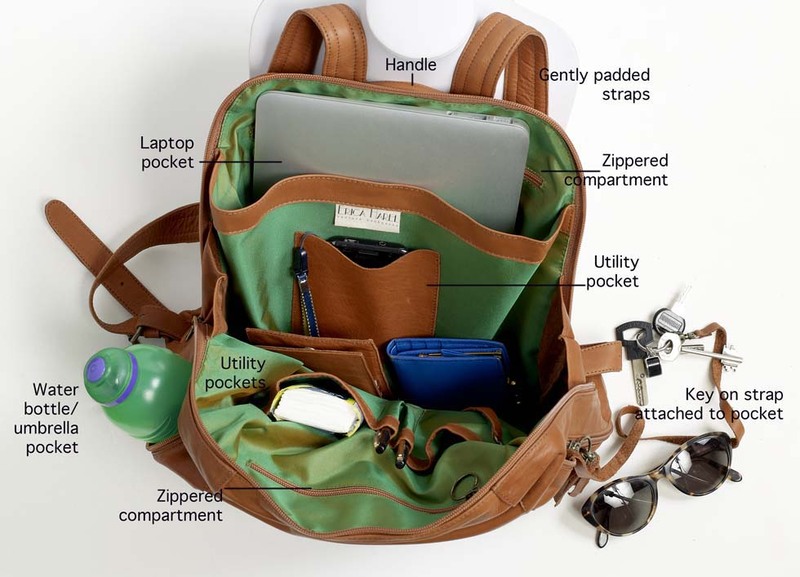 Your bag is designed to be an integral part of your active lifestyle. We hope you enjoy your bag, appreciate its qualities, and benefit from its user-friendly features. Get comfortable with your bag, and you will love it more each day. And always feel free to contact us with any questions you may have. Your bag has not undergone any waterproofing treatment. If your bag gets wet, just let it dry. Linings are water-resistant, and if zippers are kept closed, the contents of your bag should stay dry. Slight soiling or minor scuffing? Your can be cleaned with a soft, damp cloth and gentle soap. Oil stains? Cover the stain with talcum powder and let sit overnight. Brush away powder with a soft cloth. Repeat if necessary. For more serious stains, it’s best to show the bag to a leather care professional. Your bag is guaranteed for any manufacturing defects for two years of purchase. Back compartment for 13″ computer, folio-size folders, etc. One-handed access to side pockets for keys (on lanyard), water bottle, folding umbrella, sunglasses, passport … while bag stays on your back! Items under $300 are shipped via registered airmail, and may take from 3 to 7 business days to arrive. Items over $300 are shipped via Express Mail and should reach any destination from 3 to 5 business days. A $25 FedEx “expedited shipping” option is available at checkout. We will send you the postal tracking number upon request. Orders are shipped same or next day of payment. Special orders, or back orders ship as soon as product is available. All items are shipped from Tel Aviv, Israel. If you are in a country which has no direct postal service with Israel, please provide an alternate country shipping address. Please note that while there is no sales tax added to your item, local customs, duties, and import fees (for which we are not responsible) may apply in your country. Merchandise must be returned within 14 days of delivery, and must be in the same condition in which it was sent. We will email you with the nearest address to your location for returns. Shipping is paid by customer if reason is other than defect in product. We will repair any item (with original invoice) for free within two years of purchase if the damage resulted from a manufacturing defect. Return shipping will be paid by us. For typical wear and tear problems, please see a leather care specialist. Upon receipt of a returned item, your payment will be refunded within three business days. Your Erica Harel product is guaranteed for materials and workmanship from date of purchase by a 2-year limited warranty (proof of purchase required). Defective merchandise will be repaired or replaced and returned to you free of charge. If you have any questions about your purchase, please contact us, and we will reply within 24 hours. Customers in the U.S. can now pay in 4 equal installments - with "Afterpay" - at checkout! US$ personal checks or money orders, as well as international bank wires, are also accepted. Payment must clear before items are shipped.